No modifications needed on this number plate. This number plate is a real head turner. This number plate is very rare. NUMBER PLATE IS GEL EMBOSSED. ONE OF A KINDThis number plate is a reluctant sale. 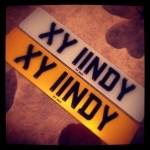 This number plate combination is hard to find.